As we all evolve as watch enthusiasts and collectors, our own personal microcosms usually start to mold to our own tastes and prejudices. Case in point, I’m a vintage chronograph guy, and as the years have passed I’ve burrowed deeper and deeper into the intricacies of that niche. Once you find a niche, however, you run the risk of developing a blind spot to the world outside. I’m guilty here as well; while my enthusiasm and involvement have grown through the years, I realized I’ve unintentionally overlooked two major segments in my travels. It wasn’t exactly intentional, but I’ve never given pilots or GMTs a fair shake. 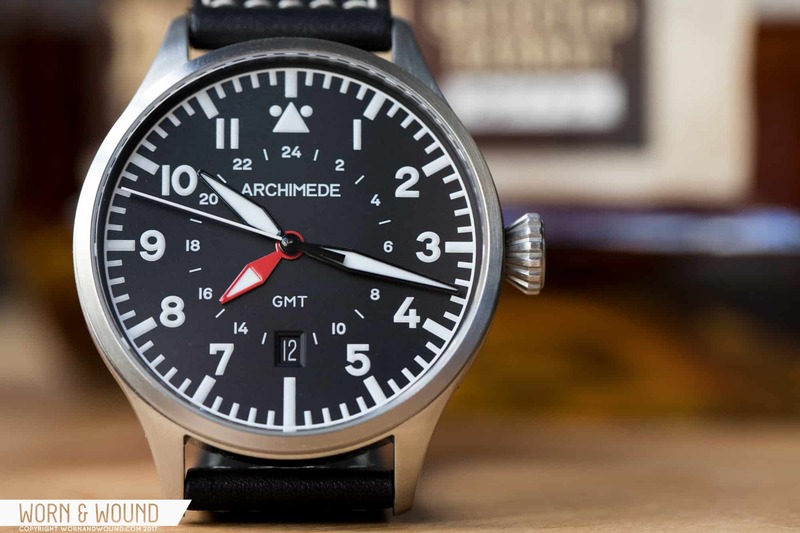 Introducing the Archimede Pilot 42 GMT, a watch that brings together both. Luckily, I’ve had the chance to rectify both of these oversights with this: the new Archimede Pilot 42 GMT, and after a while on the wrist I’m happy to say it’s opened up my eyes to both. Let’s break it down. The case design of the Archimede Pilot 42 GMT is spartan, but handsome in a pragmatic, German way. From above, it’s everything you need and nothing you don’t, with a narrow, brushed bezel flanked by thin, tapering lugs. It’s also surprisingly thin from the side, measuring a svelte 9.5mm. This keeps the flat, brushed sides from feeling too slab-sided and helps a 42mm diameter wear handsomely on even smaller wrists. A massive, flared crown with deep grooves and the Archimede “A” is the only thing allowed to break up the elemental symmetry here. In terms of the case design, that’s really about it. Don’t let the simplicity fool you, however. This basic design belies the craftsmanship involved in production. Case construction is handled by specialist manufacturer Ickler in the heart of Pforzheim, Germany. That quality is readily apparent here, with smooth, even brushing throughout. Lastly, the Ickler case offers a generous view to the beating heart of the Pilot GMT around back (more on this power plant later). 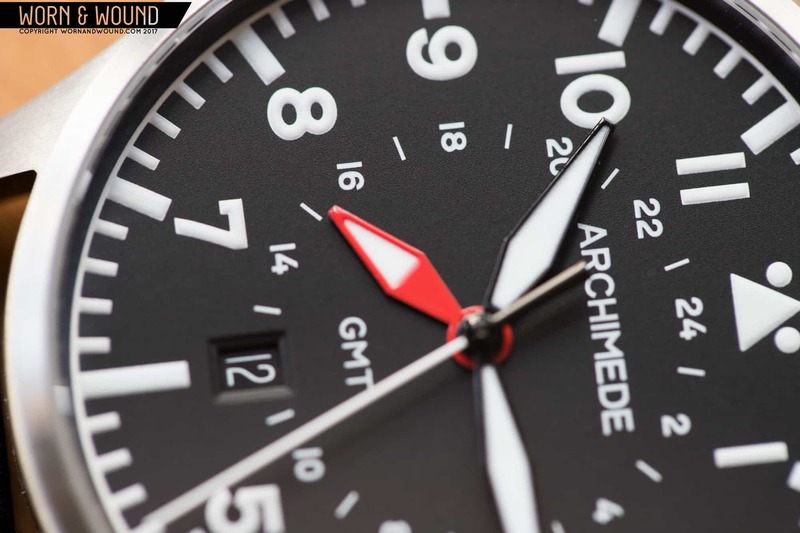 Archimede’s approach to the dial of the Pilot 42 GMT is equally elemental. All of the classic flieger elements are here: elongated sword hands, bold Arabic hour markers, and a triangle at 12. It’s the execution, however, that sets this one apart. The minutes track and indices aren’t just flatly printed onto the dial; instead, they’re all raised surfaces with generous portions of lume. The date window isn’t hacked into place at three o’clock like so many other fliegers. It’s smoothly integrated into the inner GMT hours ring, beveled and matched to the dial color. The black edges of the hours and minutes hands are glossy, adding just a hint of pop. Of course, what really separates this one from a more traditional flieger/pilot’s watch is the GMT complication. Inside the main hours track is a small 24-hour ring for the second time zone, coupled with the watch’s only real splash of color. The GMT hand itself fits the style of the main hours and minutes but features only a half fill of lume and substitutes the glossy black for high-visibility scarlet. 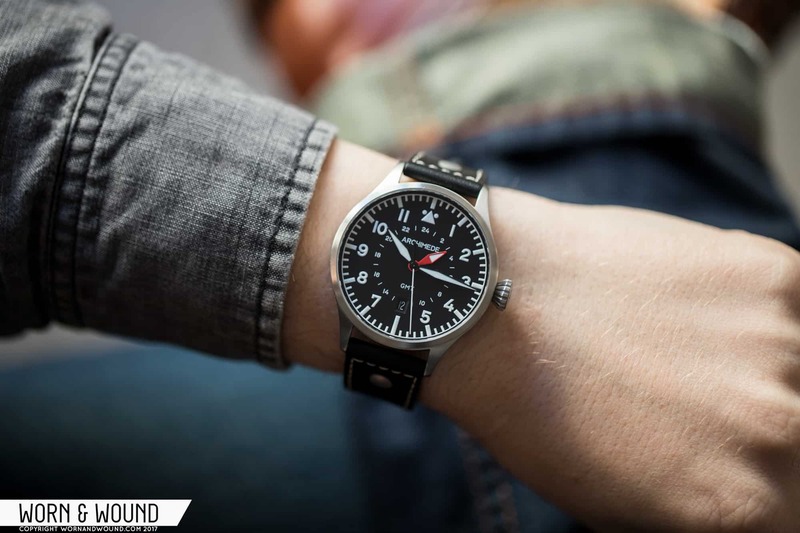 While GMTs are far from the most practical complication for most, they do make for a natural fit with a flieger. After all, if you’re an aircraft pilot, it does help to know what time it is at your next destination. That said, while it may detract slightly from the purity of the 75-year-old “Type-A” flieger design, the GMT makes for an eye-catching addition that sets this one apart from the pack. Inside the Archimede Pilot 42 GMT lies an elaboré caliber ETA 2893-2 power plant. The 2893-2 has been a mainstay in GMTs for years, finding its way into virtually every watch that uses third party movements. The ETA represents a solid balance of quality, value, and reliability, with easy parts availability and a buttery smooth beat rate of 28,800bph. The movement is function-first with just a touch of decoration. 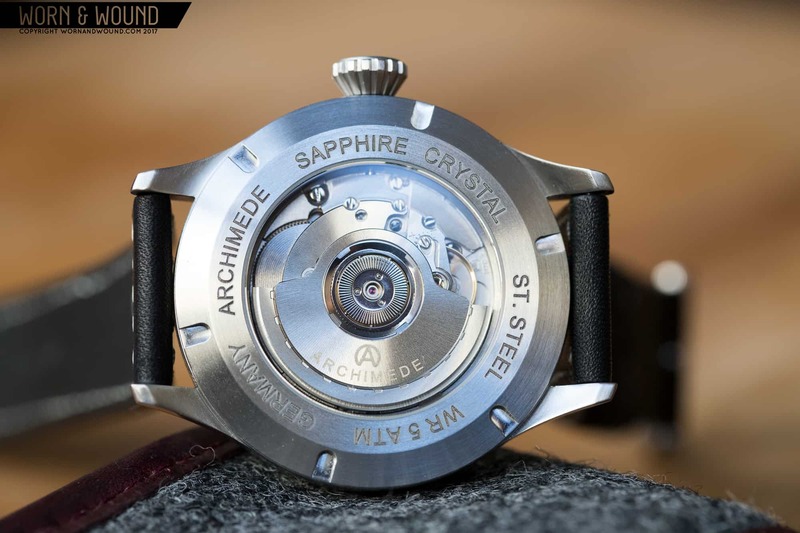 The rotor is radially brushed and etched, with an etched Archimede logo rounding out the polish. The movement is only ever-so-slightly decorated. In terms of straps, Archimede offers a wide selection for the Pilot GMT, including black, brown, and tan riveted leather, along with a choice of engineer-style or Milanese bracelet. Our tester came in on the classic black leather option, and the strap itself is more than respectable. Thick and supple with high-contrast white stitching, it’s a perfect selection for those looking for a traditional look. That said, while the options here are diverse, this would also be a perfect candidate for a more tactical nylon band. Ordinarily, a 42mm x 51mm case would be a little outside the range of my 6.75-inch wrist, but the slim 9.5 millimeter height coupled with wrist-hugging lugs make this an easily wearable prospect even for me. The all-dial design does offer a ton of wrist presence, but the classic, rugged look is a great match for all sorts of casual wear.